I'm Zoltán Matók, a freelance iOS engineer. Dogfight is a unique game that mixes cards driven gameplay with a tactical map which makes it a fun light chaos management game that emulates the acrobatic nature of WW I era dogfights. 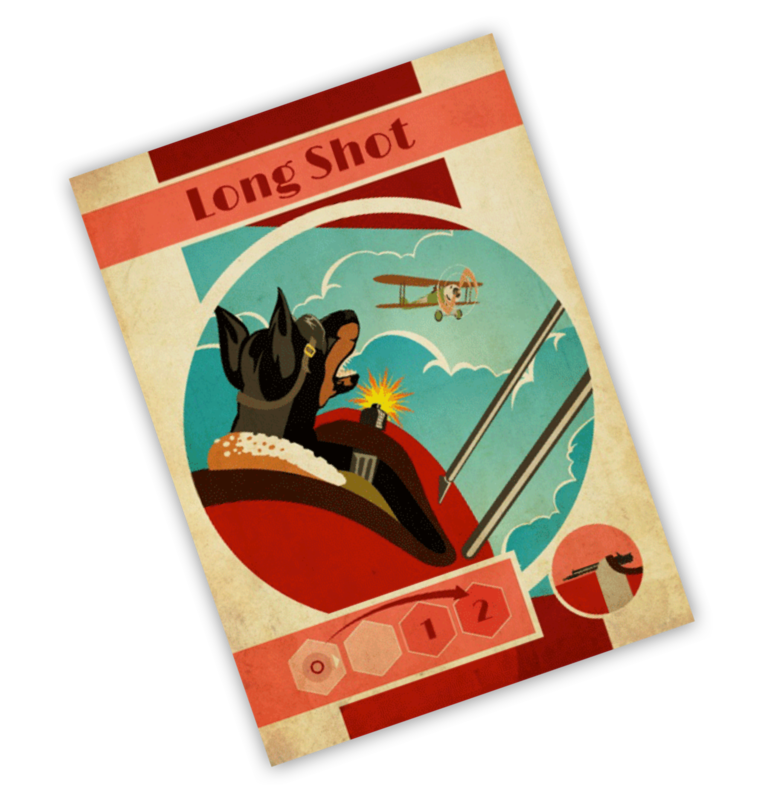 Dogfight has a beautiful, vintage art style with a zany, light-hearted theme where it's dogs that are doing the dogfighting, using cats as decoys, balloon suspended anti-air batteries, pigeon grenades, doggy treats and more. Players use cards to maneuver around each other and try to line up shots. 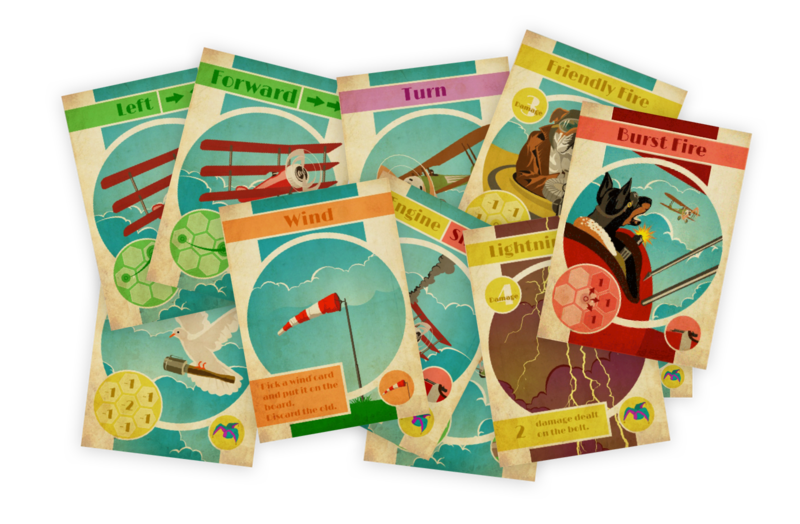 Turns are quick, consisting of moving your airplane, turning, firing, influencing the wind and using special moves (mentioned above), all activated by cards. The more damaged your airfract is, the more powerful special cards you can play. Clouds also play a role in combat as players can try and shake enemy fighters off their backs by flying into clouds (and neither they, nor their opponent can see one another). Won Best artwork and placed 2nd in the Wargame category on BGG in 2014. About me: I've been interested in aviation since forever and Dogfight is a passion project of mine. I’m a senior iOS developer and UI designer for 7+ years now, with multiple released apps. 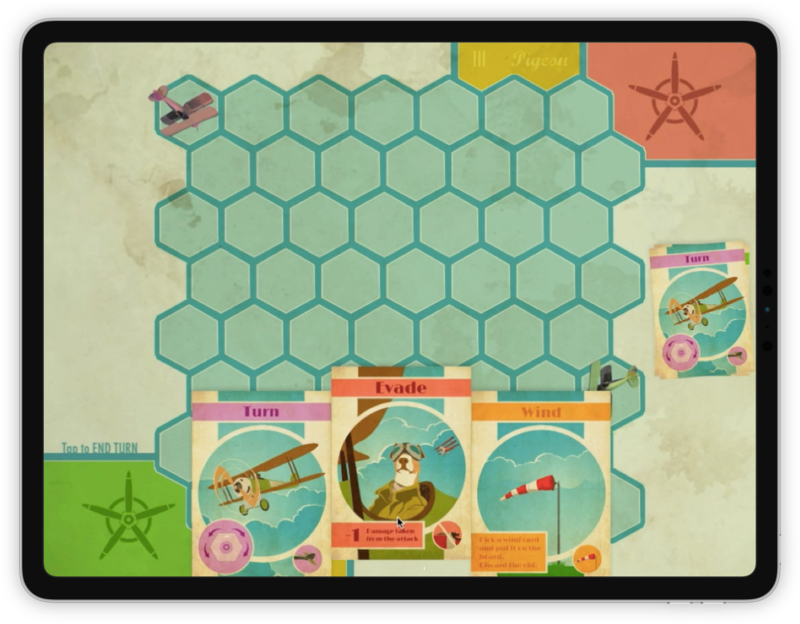 In Dogfight, players control their fighter craft on a 2D, hexagonal plain and deploy various things to try and down the enemy airplane(s). Players interact with the game exclusively using cards, of which the player has only 5 at any given time and they are dealt randomly (but from a pre-defined deck). Even movement is dictated by cards. In addition to playing the card for its effect, certain numbers of cards can be discarded to do a basic action (2 for turning, 3 for firing, 4 for changing wind direction). There are situations where players don't have optimum hand and have to make do with what they have, manage the chaos to get on top, and make decisions about what maneuvers to take, what cards to combine and play and what cards to hold on to, for later. It's a dog's life in the skies, so in addition to "standard" dogfighting, players can deploy various "surprises" like cats on kites as decoys, balloon suspended batteries, pigeon grenades and more to mess with their opponents. Wind and clouds also play a role. Aircrafts drift an additional space in the current direction the wind is blowing at after moving and players can hide in clouds to shake opponents. Clouds can be deployed (along with lightning) and are also spawned randomly and float in from the edge of the map, according to wind direction. For iOS & Android. Switch, PC, Mac later. The game is built in UDK to make porting it to other platforms easier. Championships: Unique, yearly, global events pitting either every participating player or nations against each other. Players are matched against one another and the first 3 players win physical, albeit token, prizes. Like this, this (but with the game's dobermann) or a fractureme.com glass poster with unique art (about the game). Championship matches are streamed and are watchable online. War: Players are assigned to fronts on a visual world map (either fictional or the real one) against each other with daily / weekly evaulations of front advances based on the results of matches played. Challenge mode: Single player mode that sets players up in fixed scenarios with the task of taking down the enemy plane using specific cards and a limited amount of turns. Story mode: Shape your own story, defeat enemy aces, overcome dogged resistance. Players will be able to make important choices during an engaging story campaign and meet different canines. Dogfight will either feature one longer story or multiple shorter ones with differing mood and atmosphere. Each player draws five cards from the deck and the game begins. Cards are used to control your plane and to some extent - the battlefield. Players can take actions by playing or discarding cards. Each airplane starts with 5 hit points. The first player to make their enemy’s hit points reach zero, wins. You can take any and every type of action in your turn, but each action can be taken only once per turn. The one exception is that you can either take an attack or special action in a turn, not both. Taking an attack or special action ends your turn. The movement action is mandatory. If you have no movement cards or do not wish to play them, you must move 1 space forward with your plane during your turn. This movement is not affected by the wind. Attack or special actions can only be taken after a move action has already been taken in that turn (because they end your turn). You can opt to take no actions in your turn except for a mandatory movement action. You can play a WIND card or discard any 4 cards from your hand to change the direction of the wind. This replaces any previous one. The direction of the wind affects the movement of the planes in the game. After taking their movement action, airplanes are drifted an extra space in the current wind trajectory. 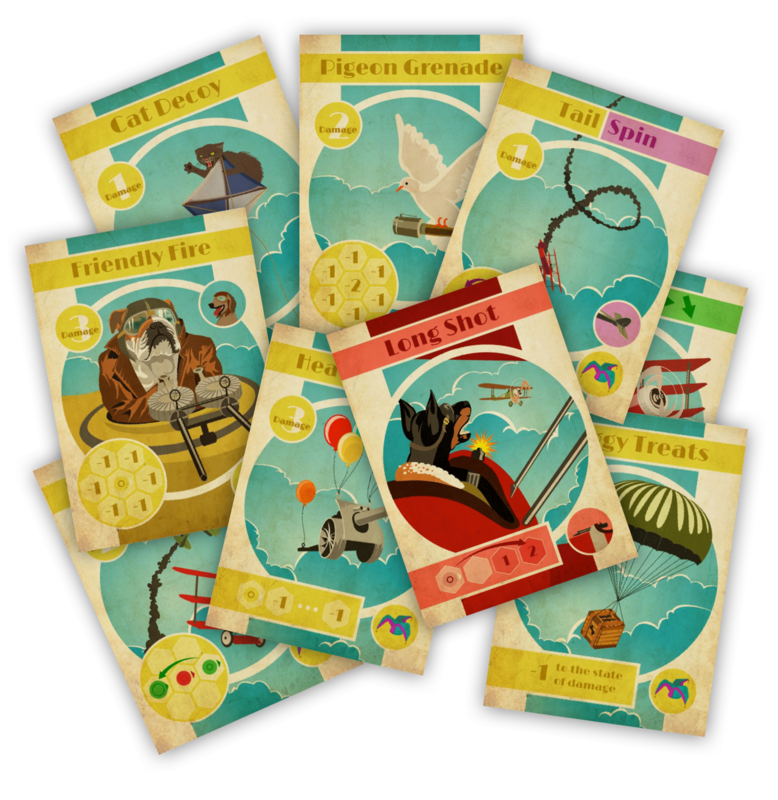 Players can rotate their airplane or Heavy Artillery by playing a TURN card or discarding any 2 cards from their hand. If the action is taken by discarding cards, the airplane or the artillery can only be rotated 1 space left or right. If the player decides to use the TURN action to rotate the artillery, their plane is not allowed to turn in that round. (The TURN action is already used up in that round.) Only the player’s own aircraft or artillery can be rotated. Players can move by playing a MOVEMENT card or taking the ‘free’ forward movement action. When playing a card, the airplane moves according to the illustration on the card. The wind affects some of the movement cards. Players can fire their machine guns by playing an ATTACK card or discarding any 3 cards from their hand. ATTACK cards show where the player can aim and what the damage is at different distances. If the action is taken by discarding cards, the airplane deals 1 damage in the space directly in front of the airplane. Taking an ATTACK or a SPECIAL action ends your turn. Only 1 of these cards can be played in a round. SPECIAL cards can only be played when their airplane is damaged to a certain level. Taking a SPECIAL or an ATTACK action ends your turn. The first expansion - Look who's barking - brings in a special kind of SPECIAL card, the co-pilot. They remain in play until you lose them or switch to a different one. Leaving the area Planes are not allowed to leave the hexagonal play area during the game. They must try everything to prevent crashing into the edge of the board. If they still fly off the board, they suffer 1 damage, and their airplane will be placed on the last tile in its path and turned parallel to that edge. Crashing Planes are not allowed to collide or to move into an occupied space. There might be a case when a plane is at the edge next to the opponent and a collision is unavoidable. In this case that airplane will be placed beyond the opponent's airplane, facing away from it and you will suffer 1 damage. 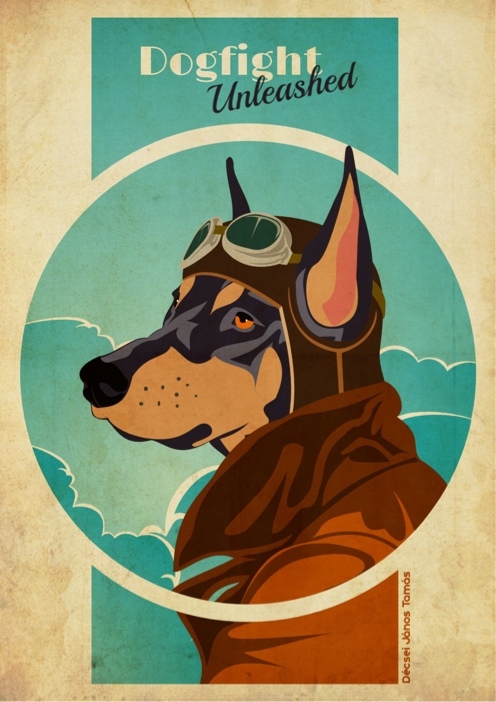 Dogfight has a beautiful, clean, vintage art stlye with anthropomorphic dogs as pilots. The art invokes the years around the first World War and the birth of flight, and planes are bi- and triplanes. The current footage depicts a very early version of the game. While the game is in 2D, gameplay objects like the airplanes, clouds, the balloon artillery and so on will be rendered in 3D. Visuals will be crafted in a way that the pieces of the game are emphasized nicely against both the backdrop of a dimmed countryside, sea shore or other landscapes beneath the action as well as the board itself. Dogfight has a streamlined, highly accessible, gesture driven user interface, that makes it easy and pleasant for anyone to play the game. The UI also makes the artwork pop, foregoing obtrusive indicators, buttons and numbers. Status indicators like damage will be woven into the game world itself, opting to show an increasing amount of smoke coming from the airplane rather than showing it with numbers and labels. Dogfight's customers are gamers who like tactical combat and/or card games, aviation fans interested in semi-casual games and people with a preference for artistic games. The quirky, humorous art appeals to a wide range of audiences, and helps spread the game. I plan to use Discord to grow and nurture a fan base, with discussions about new builds as the development progresses, tactics discussios, brainstorming, organizing online events, bug reports (Bugs breed quickly, down there in the dark. But perhaps, we can slay them even faster.) or feature requests for the so inclined. I have entered into a contract with the game's original designer, János Décsei to grant me a license to develop the digital version of the app and for János to get 20% of the total revenue for 5 years after release. I plan to release the game for $10 with a free trial (I'm not a fan of the race to the bottom pricing on the App Store). I'm seeking $24,000 to make the base game and the first expansion - Look who's barking. I estimate the development time to be about 12 months. The game will be made in UDK which will make it easy to port it to different platforms (Android, Swithc, PC, Mac). The Challenge mode would set players up in fixed scenarios with the task of taking down the enemy plane using specific cards and a limited amount of turns. Shape your own story, defeat enemy aces, overcome dogged resistance. Players will be able to make important choices during an engaging story campaign and meet different canines. Dogfight will either feature one longer story or multiple shorter ones with differing mood and atmosphere.